Robert S. Taubman is chairman, president and chief executive officer of Taubman Centers Inc. He has headed the company and served on the Taubman Centers Board of Directors since the company's initial public offering in 1992. He is a member of The Taubman Company’s Operating Committee. Robert joined Taubman in 1976, was elected executive vice president in 1984, chief operating officer in 1988, president and chief executive officer in 1990 and chairman in 2001. 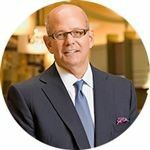 Robert serves on the Advisory Board of Governors of the National Association of Real Estate Investment Trusts (NAREIT) and is a member and immediate past chairman of the Real Estate Roundtable in Washington, D.C. He is a member and past trustee of the Urban Land Institute (ULI) and founding chairman of ULI’s Detroit Regional District Council. He also is a member and past trustee of the International Council of Shopping Centers (ICSC). Robert is a member of the board of directors of Comerica Incorporated (NYSE: CMA) and is a past board member of Sotheby’s Holdings, Inc. (NYSE: BID). Among his many civic and charitable commitments, Robert serves on the executive committee of Southeastern Michigan Council of Governments (SEMCOG) and is a member of the board of directors of Business Leaders for Michigan. He is a trustee of the Cranbrook Educational Community, where he is chairman of the audit committee. He serves on the University of Michigan Investment Advisory Committee, and is a council member of the Belfer Center for Science and International Affairs, Harvard Kennedy Schools. Robert holds a B.S. degree in economics from Boston University. Taubman Centers, Inc. (NYSE: TCO) is an S&P MidCap 400 Real Estate Investment Trust engaged in the ownership, management and/or leasing of 26 regional, super-regional and outlet shopping centers in the U.S. and Asia. Taubman’s U.S.-owned properties are the most productive in the publicly held U.S. regional mall industry. Founded in 1950, Taubman is headquartered in Bloomfield Hills, Mich. Taubman Asia, founded in 2005, is headquartered in Hong Kong. www.taubman.com.